I will be travelling to Mumbai and from my company Thane is the nearest railway station. I will be travelling from Ahmedabad, Gujarat. Can any one help me find the best train to travel? Should I reach to Mumbai Central and then travel to Thane by local train or any direct train is available? I will prefer super fast or express trains only. I tried google but no one can help better than experienced travelers. As someone who regularly visited that route (Ahmedabad to Thane), I advise you take an overnight train (preferably Gujarat Mail) or ADI-BCT superfast. 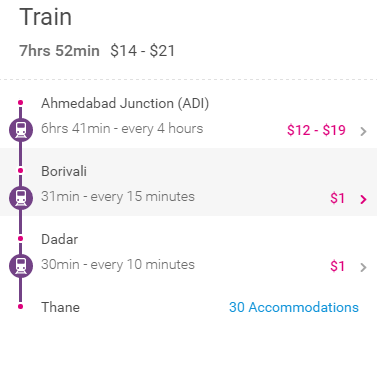 Choose the one that has a halt at Borivali (Duranto doesn't; it has only one stop: Mumbai Central). For morning, double-decker is a good option. This is because Thane is located to the east of Mumbai and commute by trains, whether local or inter-state, does get cumbersome. Just outside from the Borivali station(East), take bus number 700 which spans the entire run of Ghodbunder highway covering all the major areas in Thane from West to its last stop at Thane Station East. However, if you decide to stick to trains, get down at any of the major western Mumbai stations (Borivali-Andheri-Dadar-Central) and take a local to Dadar. From there, change the platform to Central line and take a train to Thane. DO NOT take the passenger as it takes around 23 hours to get there. A faster alternative is to fly to Mumbai and take a local train there. Not the answer you're looking for? Browse other questions tagged trains public-transport india indian-railways mumbai or ask your own question.